PAKYI, GHANA. When a rainstorm devastated a local school in rural Ghana, Sandvik Mining and Rock Technology answered the call for help. The students at Pakyi School No. 1 dream of becoming doctors, pilots and engineers. Their teachers emphasize how taking their studies seriously can improve their future career prospects. But conditions haven’t been conducive for learning since a rainstorm in December 2014 razed several classroom blocks at the 900-student school in a rural farming community 20 kilometres south of Kumasi, one of Ghana’s largest metropolitan areas. Teacher Hannah Amankwah vividly remembers the Friday downpour. In the weeks that followed, teachers improvised to keep the school open for the displaced students. They converted the school’s ICT building into a classroom and demarcated it to hold two classes, 60 students on each side of the 190 square-metre room. Some primary classes were combined into already-overcrowded classrooms that had survived the rainstorm. Sitting under trees to learn proved increasingly difficult for students after the rainstorm. To enable younger primary classes to remain indoors, makeshift classrooms were established outside under trees for the older junior high school students. On rainy days, their classes had to be cancelled. 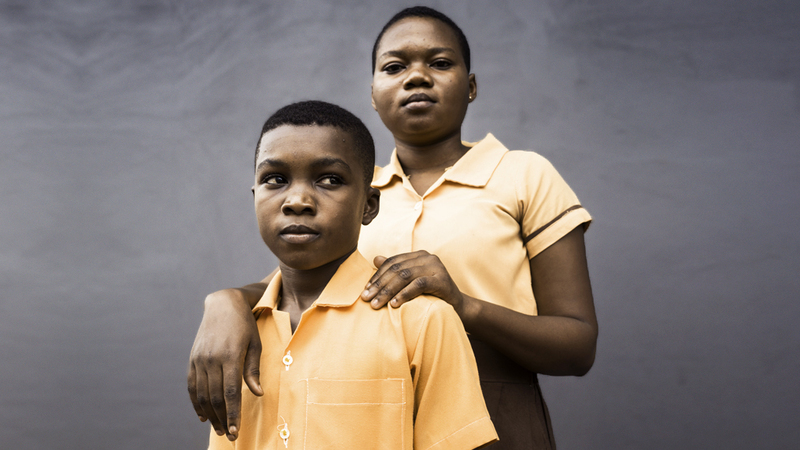 The drastic measures were difficult for students like Janet Appiah. “It has been very difficult for us to learn sitting under the trees,” says Appiah, a third-year junior high school student who hopes to become a nurse. When repeated attempts by Pakyi community leaders and school authorities to obtain financial assistance from the cash-strapped Ghana Education Service proved unsuccessful, they turned to neighbour Sandvik Mining and Rock Technology for help to rebuild. The company in 2013 had opened its West Africa service center and warehouse facility just a few minutes’ drive from the school on land the company purchased from Pakyi tribal elders. The storm that toppled part of the school also severely damaged the Sandvik facility, shearing off part of the service centre’s roof. As soon as Sandvik restored its facility, Nuhu Salifu, the company’s vice president for Sales Area West Africa, visited the school and was moved by the damage. “Wherever we work in West Africa, we take the view that we are not just here to work,” Salifu says. “We actually work to impact the life of the society at large. We have a number of stakeholders that we need to work to satisfy, including our shareholders, our employees, and then also the communities where we work. Local Sandvik leadership obtained top management approval to finance construction of a six-classroom block. Following consultation with local opinion leaders, chiefs and traditional rulers of the community and permitting from local authorities, construction began in 2017. “This building is going to give us a comfortable room for them to stay. So we are most grateful and we are really, really happy," says Hannah Amankwah, teacher at the Pakyi School No. 1. Sandvik selected a local contractor following a sealed-bid tender process. HR manager Samuel Brewu says the company was impressed by the contractor’s past work in similar community-based activities. Reflective of the emphasis on using local resources, portions of the new block’s roofing integrate wood recycled from pallets and containers used to ship Sandvik spare parts and equipment. Fifty years after the school was first built, Sandvik inaugurated the new classroom block in early 2018. Sandvik and Goldcorp partner to develop the first all-electric mine in the world. Safety initiatives started by the US Mine Safety and Health Administration bear impressive fruit in 2015.